Americans will spend about $9 billion this Halloween on costumes, decorations and candy. Most of this merchandise is single use and comes in packaging that can’t be recycled. 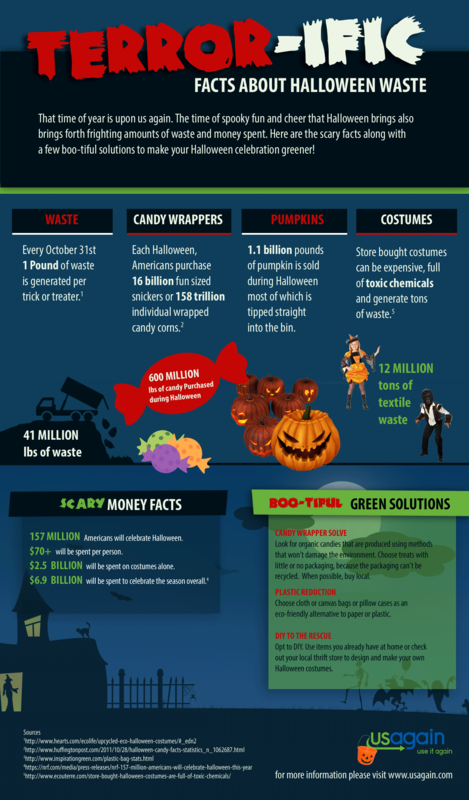 In fact, the amount of Halloween waste we generate each year is downright terrifying. But fear not! There are lots of creative ways to green your Halloween and save money while having a ghastly good time. Buy pumpkins, gourds and cornstalks from local farms, nurseries or farmers markets. Have a green goblin thumb? Grow your own next year. And don’t waste those pumpkin guts – use the flesh in recipes and roast the seeds for a healthy snack. Swap, buy used or create upcycled decorations. You’d be surprised by how easy it can be. It took me less than 30 minutes to transform a selection of sweet-faced knick-knacks into a motley crew of creepy décor using a little paint. You also can swap, buy used or make upcycled costumes. Use ingredients you have at home to make face paint. Next September, host a Halloween costume swap party. Use up arts and crafts supplies by upcycling buckets, pillowcases, cans, t-shirts, gift bags or reusable totes for trick-or-treating. Trick or treat in places you can reach on foot or by public transit. Please don’t litter! Parents – bring a bag and gloves or grabber tool to pick up litter along your trick-or-treating route. Your little ghosts and ghouls shouldn’t be leaving a trail of candy wrappers in their wake. Want to help keep ours a clean green county year round? Clean streams and public lands with your local watershed association, do a Clean Green 15 pickup in your community, or get your group to participate in the Adopt-A-Road program. Send invitations electronically. Serve locally-sourced food and drink. Buy fair-trade chocolate. Use reusable linens and kitchenware. If you must purchase new items for your Halloween celebrations, look for products and packaging made with recycled content. Serve witches’ brew or Frankenpunch in drink dispensers instead of beverages in bottles and cans. Use a meal planning tool to determine how much food to prepare. Store leftovers in reusable containers and (actually) eat them. Put out a recycling bin and ask your guests to use it. Visit the County’s website to find out what is and is not accepted for curbside recycling collection. Use leftover candy in baked goods, ice cream sundaes, snack mixes, cereal bars and more. Use your imagination, or try one of many recipes found on Pinterest. Have a Green-o-ween idea you’d like to share? Send it to cleangreen@baltimorecountymd.gov. Follow Clean Green Baltimore County on Facebook for news and information to help you live more sustainably.